This is a partial preview. Full document is 147 slides. View large preview. Learn how to align the whole organization to achieve breakthrough objectives. Learn how to define individual accountability for achieving their part of the plan. Ready-to-use templates: X-Matrix, A3 Deployment Table, Daily Management Matrix, etc. Hoshin Kanri process is a powerful strategy deployment methodology for defining long-range key entity objectives. These are breakthrough objectives that extend two to five years with little change. In addition, the Hoshin Kanri process does not lose sight of the day-to-day business measures required to run the business successfully. This dual approach provides an extended period of time for the organization to focus its breakthrough effort, and at the same time, continuously improving key business processes day to day. This methodology continues to be used by some of the world's most successful companies such as Toyota, Nissan, Rover Group, Texas Instruments, Danaher, Bank of America, Bridgestone Tire, AT&T, Exxon Chemical, SingTel, etc. This product contains a supplemental XLSX document. Strategic Planning? Strategy Development? 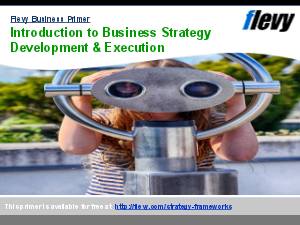 Strategy Deployment & Execution? Or something else.